More than 58,000 Puerto Ricans have fled to Florida since Hurricane Maria devastated the island last month, according to new figures released by Gov. Rick Scott’s office, which tallied the influx of people through the airports in Miami and Orlando and the Port Everglades seaport in Broward County. Florida schools have also enrolled more than 2,000 new students from storm-struck Puerto Rico and the U.S. Virgin Islands. Scott declared a state of emergency in Florida on Oct. 2 in response to the hurricane’s impact on the U.S. territories, and disaster relief centers were opened at the Orlando International Airport, Miami International Airport, and the Port of Miami to provide assistance to evacuees fleeing to the state. Those centers have provided assistance to more than 10,000 people, according to state figures. As The 74 reported earlier this month, Orange County Public Schools, the district located in Orlando, is among local agencies offering services in the airport to new arrivals. School officials are on site to help displaced families enroll their children in school, and to recruit displaced educators. Last week the House of Representatives approved a $36.5 billion emergency relief package to fund disaster recovery efforts in Puerto Rico and on the U.S. mainland. Though that package does not include money for schools, Florida education leaders and lawmakers say districts will need additional state and federal money to best serve displaced children. 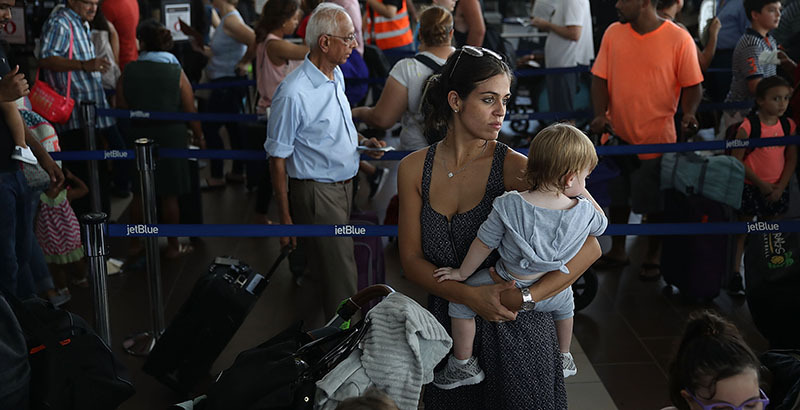 The influx of Puerto Rican families is unlikely to slow anytime soon; the island still lacks basic utilities like electricity and running water, and Puerto Rico Gov. Ricardo Rosselló said he hopes to restore power to 95 percent of the energy grid by mid-December. Puerto Rico Education Secretary Julia Keleher had set an “ambitious target” to reopen a majority of the island’s 1,113 schools by Monday, but as I reported yesterday, that goal has been pushed back to Oct. 30 at the earliest. Nearly 200 schools on the island are currently being used as community centers, and an additional 99 buildings are being used as shelters for displaced families.